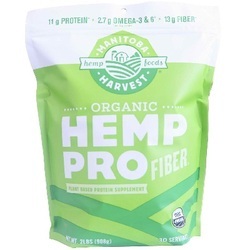 Organic HempPro Fiber is packed with 13g fibre per 30g serving. One serving of HempPro Fiber represents 52% of the recommended daily intake (RDI) of fiber - greater than a similar serving of Metamucil or bran cereal. Fiber is an important part of any diet, aiding in digestive health and helping you feel full longer. Plus, with HempPro Fiber you are also benefitting from protein and healthy omegas. Made with only organic hemp, HempPro Fiber is a raw whole food. Blend into smoothies, or add to baking recipes like you would spelt flour.